Top:The Peter and Patti McMullen farm yard east of Moosomin saw some equipment damaged by a grass fire apparently sparked by a train on Wednesday afternoon. 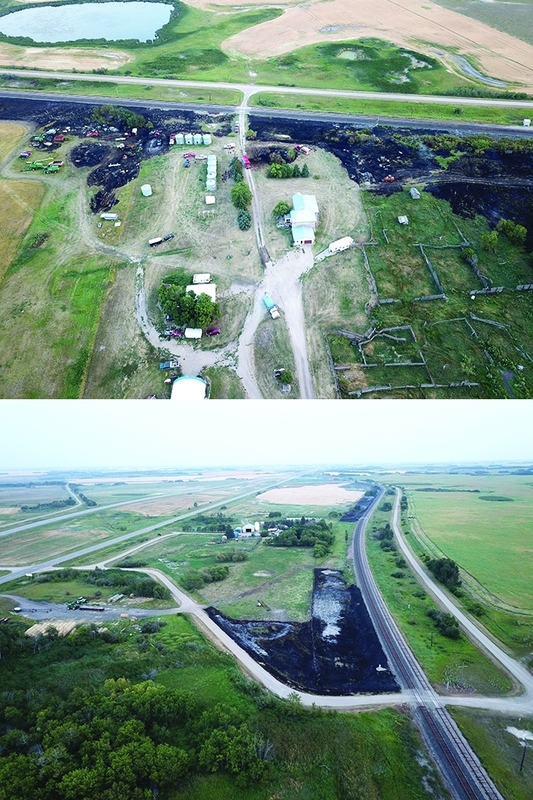 Bottom: Fire came close to the John and Jacqui Harrison farm yard east of Moosomin in the fire Wednesday. Some of the barley crop was destroyed by fire in the field in the background of this photo. 42 firefighters from four fire halls, using 14 fire trucks and water trucks were involved in fighting a fire Wednesday afternoon and evening that stretched along the south side of Highway 1 between Moosomin and Fleming. Highway 1 was closed between Moosomin and the Manitoba border at one point because of smoke. The call came into the Moosomin Fire Department at 3 pm Wednesday, and the Moosomin Fire Department was on the scene until 11 pm. The Moosomin Fire Department was assisted by firefighters from Wapella, Elkhorn and Virden. “Once we saw how many spot fires there were, we made the decision right away to call for mutual aid on both sides,” said deputy firechief Mike Cooper. He said many people volunteered to help bring water to the site. The tracks were shut down while firefighters battled the blaze. Besides the firefighters, many local people helped out by hauling water, providing tractors and discs, supplying a track hoe and helping put the fire out. Moosomin Fire Chief Rob Hanson said the fires appear to have been caused by a train, as small fires started from just east of Fleming to the edge of Moosomin. He said it was a difficult fire to fight because of the location. “The biggest issue was getting to it,” he said. “Because it was along the tracks, we couldn’t get to it with equipment, so we were fighting it by hand. “We were called out yesterday (Thursday) morning, then again yesterday afternoon to take care of hot spots, and I took a drive along there this morning (Friday) and put out a couple of spots. Hanson said two residences were threatened by the fire. “It was within less than 100 feet to McMullens’ house. It basically surrounded their yard, we were able to get it shut down before it got to the corrals. He said the blaze was not one large fire but a series of separate fires set off by sparks. “The first fire was just west of where you turn into Fleming, and the last fire was right by Springer’s building, but it was really bad at Harrisons and McMullens,” he said. There are burning bans in place in the RMs of Moosomin and Martin, and the town of Moosomin may follow suit at a meeting this Wednesday.